Unless you live under a rock, you’ve heard a great deal about the earthquake and tsunami that devastated Japan on March 11. If you’re among the best of us, you’ve even done your part by donating your time and money to the recovery effort. With reports rolling in of so many thousand people dead and missing, it can be easy to forget that Japan is home to thousands of animals, too, who were also affected by this tragedy. But if there’s one thing we here at Popfi think about, it’s animals. Baby animals, especially. One of the luckier little critters in Japan right now is a baby dolphin, who has been rescued from a rice field after it was dumped there by a giant tsunami. 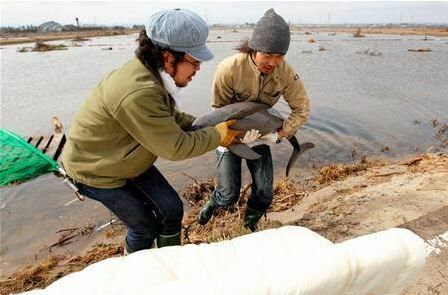 The little dolphin was rescued from the rice paddy by Ryo Taira, a pet shop owner who has been rescuing animals abandoned by the earthquake and tsunami. He was alerted to its presence in the flooded field by a passerby, who insisted they had to save it. The animal was already weak by the time Taira found it striving to swim in the shallow water. After initial attempts to net the dolphin failed, he waded out into the field and picked the four-foot creature up in his arms. With the help of friends, Taira wrapped the dolphin’s body in wet towels and drove it roughly a mile back out to the coastline, where it was released back into the Pacific. Taira says he can’t be certain whether the animal will survive, but he feels it has a better chance of living in the ocean than in that field.